As I celebrate my birthday today, I am immediately overwhelmed by feelings of gratitude to The Almighty. Over the last year there have been many major changes that have happened in my life. Some good, some not so good. But, they have brought me to a place where I yearn for simplicity. I have always been a simplistic soul in the making…I just didnt know how awesome it would feel when I actually simplified EVERYTHING! To be simple and thankful together, is a sure shot recipe for inner happiness. I have simplified not only my outside world, but also my inside world. My thoughts and feelings, my hopes and dreams, my life purpose and my goals….have been drastically simplified. From wanting to write a book for fame to now writing a book for the sheer joy of helping, from wanting a massive house to now living in a cosy apartment with my family, to feeling overwhelmed by wants to being happy with my simple needs being met…..everything has been simplified and the process has made me so thankful for every little second to millisecond of my life. I’ve simplified my writings, my blog and my ways….and am so so thankful for all the appreciative readers here on Positive Provocations. Ironically my simplified ways are appealing more hearts than my complicated past layers…just goes to show what really touches hearts. right?!?! I am happy to BE me today 🙂 How fun is that? Practicing gratitude has made me simplify and attain inner peace and happiness. On the occasion of a Heart full of gratitude on my birthday, I asked some of my beautiful and soulful friends, who also happen to be SUPERB life coaches, thinkers, writers, healers, bloggers and over all Positive souls you ought to know……..
How do you practice gratitude everyday and how has that positively affected your being? Their answers and their ways will motivate you, inspire you and make you start being Grateful right this instant! Enjoy darlings…..
Dragos Roua @ DragosRoua.com said : I practice gratitude because gratitude re-shifts the focus from what I may have lose to what I may have. Even if I lose something in the process, I’m grateful for anything I got, because being grateful will enforce those parts and send the loss in the shadow. It’s not always easy, but when I’m able to do it with my entire heart, I am reborn. It helped me see that, even if I am made of dark and light, like any other human being, I can control the percentage of light and dark in my being. Amit Sodha @ Unlimited Choice said : I’m am by no means perfect at this, I’m still learning and shifting away from being dissatisfied to being more grateful for the things in my life. That also includes all the things that I wouldn’t otherwise normally be grateful for. Things like, time to myself on my train journey to work, even in the rush hour; having a lovely car that is reliable and luxurious, even when I’m in a traffic jam. I’m grateful for the amazing technology that is at my disposal that allows me to do amazing things that 10 years ago we would not have even thought possible. For anything bad, there is something good to be found, no matter how small. This small shift has made biggest difference to my life. I’ve started to love my enemies and cherish my flaws. Each and everyone of those things is a gift. Seeing both sides has allowed to appreciate them and become more centered, fulfilled and has granted me a feeling of greater harmony. Annabel Candy @ Get in the Hot Spot said : I am really simplifying my gratitude practice down to just being grateful to be alive and to be experiencing whatever is going on in my life at that moment, even if that happens to be uncomfortable emotions or a long wait at the post office. It’s all good as long because as I am breathing there is more right in my world than wrong. Having said that I try to make time for good experiences by consciously slowing down, walking daily on the beach and meditating outside so I can hear the birds sing and the wind in the trees whenever I can. I prioritize meditation and make sure it happens most days. Earlier this year I was feeling really depressed but this practice has helped me find balance and contentment. There are still bad moments but I know that’s all they are which makes it easier for me to cope with anything in short term and happier in the long run. Farnoosh Brock @ Prolific Living said : I practice daily gratitude with: – Smiling at myself in the mirror and making true eye contact first thing in the morning. This sounds vain but it’s actually very hard to do because in that smile and eye contact, I am expressing my gratitude for everything I am that day, with all the flaws, pains and blemishes. – Showing kindness to my husband in everything I do, and listening to him. He’s a great source of joy and love in my life and I am grateful for him beyond words. So I smile a lot 😉 . – Meditation to express gratitude for my life, my freedom, and the happiness of those who matter to me. – Handling my food with gentle care and never wasting a bite, I show gratitude for the food that nourishes my body and my soul. – Giving to those around me, to express my gratitude that they are there in my life. This can be small or large, online or offline friends, as much as I can. It has taken away the focus from myself and my silly worries to the world outside, to what really matters, and to a great sense of present moment. It has made me light with joy and happiness. Paige Burkes @ Simple Mindfulness said : My gratitude practices have evolved as my kids have gotten older and my daily schedule and lifestyle have evolved. Years ago my practice was to write ten things I was grateful for followed by ten goals, large and small, in my gratitude journal. My only rule was that I couldn’t repeat anything I had written over the course of many days. The more I did this, the longer my list got. Some days I went on for three or four pages of things I was grateful for. As my children have needed more of my time and attention, I found the practice of writing in my gratitude journal more difficult to maintain. During this time I’ve been implementing more mindfulness throughout my life. Instead of writing what I’m grateful for, I take a moment to notice the little things as I think about or experience them throughout my day. When things get crazy and stressful, I take a deep breath to bring myself back to the present moment where everything is always beautiful. I smile and say, “Thank you!” to the Universe for bringing me that moment of peace. Knowing that I’m always surrounded by an infinite number of people, things and experiences to be grateful for keeps me from sliding back to feelings of “not enough” and reminds me that life is pretty awesome, no matter what’s happening. And I remember that I can choose to be happy at any time. Evita Ochel @ Evolving Beings said : For me gratitude has become not just a daily practice, but what I will call a “momentary” practice. This meaning that I apply appreciation and/or gratitude for something in my awareness throughout numerous moments, each day. This usually includes some gratitude-based affirmation or acknowledgement that I share with others in my presence, or simply experience personally in the silence of my being. It can be inspired into action during some experience in nature, or with my life partner, or in my creative work, or through some social interaction. It can also be inspired simply by observing the experience of another being, often a stranger, and finding the gratitude within my own life for whatever their experience teaches me. Today I am abundant in mygratitude practice because I know that whatever is appreciated, flourishes, and I see the outcome of this in my life each day. Living with gratitude daily has allowed me to cultivate a high degree of joy, appreciation and inner peace. It has empowered me to be accountable for being the source of my own happiness, and the creator of my life experiences. My life quality today has benefitted greatly thanks to it in every area from my health and relationships, to my how I spend my time and what I choose to invest my energy into. Galen Pearl @ 10 Steps to Finding Your Happy Place (and Staying There) said : I practice gratitude on a daily basis by keeping a gratitude journal. Every day before I go to bed, I write down at least one thing I am grateful for from that day. Besides the journal, I also often think of a one minutegratitude list while I’m waiting at a stop light or waiting in line. And finally, I try to say thank you to others every chance I get. So thank YOU for thinking of this wonderful idea. Hiten Vyas @ HitenVyas.com said : I practice gratitude in the morning by doing my daily prayers first thing and thanking God for keeping me well and healthy. I also thank Him for giving me such wonderful family and friends and keeping them safe. During the day, I continue to be grateful for an opportunity to do meaningful work, and have good colleagues around me. Expressing gratitude has helped me to spend more times during a day being happy than being unhappy. It has helped me to appreciate what I have and inspired me to help those who might not be as fortunate as me. Brad Volz @ Writing To Freedom said : I’ve been planting seeds of gratitude in my life over the past several years. My current gratitude practice is to exchange daily emails with my gratitude partner. We share 3 things that we are grateful for each day. Previously, I’ve practiced both writing and speaking aboutgratitude each day. All of these practices are creating the habit of looking for good in my life. This doesn’t mean that I feel grateful each moment, but I usually remember to look for something to appreciate in my life. The gratitude practices encourage me to pause and refocus on gratitude for at least a few moments each day. I’m learning to let go of my stories and attachments. I find it more powerful to have another person to both share with and be accountable to. Sometimes, I’m even grateful for my challenges! Arvind Devalia @ Make it Happen said : I practice gratitude daily by spending meditative time in nature during which time I reflect on all the good things in my life and around me in that moment. I simply close my eyes and visualise all the good things that have happened to me in the previous 24 hours. I also keep a “Received & Given” notebook in which I regularly write down all the gifts I have luckily received from others and also the ones I have been privileged to give to others. This exercise always reminds me of how much I am receiving and also how much I can share with others. From both these regular exercises, I feel really humbled and truly grateful for all the goodness in my life. And of course this deep sense of gratitude also helps to keep me childlike for ever! Evelyn Lim @ Abundance Tapestry said : I like to remind myself how grateful I am for my blessings. I do this with a prayer practice that starts with and for myself, before extending love out to my family members and others. My favorite daily practice is to show appreciation to my children for being who they are. Then, during the day, I usually end my energy healing sessions for others with a note of thanks to my spiritual team. Finally, I give special thanks to the Universe for sending ideas, people and resources my way. Having a sense of gratitude shifts me into greater joy and awareness of the wonder and miracle of my being. Tim Brownson @ A Daring Adventure said : It’s funny because I’m not sure I have actually ever thought of it as practicing gratitude consciously, but every morning around 11am I take my dogs for a walk. When I do so I frequently get on a gratitude train of thought because the place I take them is amazing and even after 6 years I still haven’t grown tired of it. I wouldn’t say I do it every day, but pretty much most days I start to think how lucky I am and I almost always end the walk feeling great and looking forward to the day ahead. Sandi Amorim @ Deva Coaching said : My gratitude practice began to make a difference for me when I shifted from gratitude as the focus, to savouring the details of my life. This subtle shift, which may seem like semantics, was profound and had a greater impact than the practice of journaling, which is so often recommended. For me, a gratitude journal always felt like one more thing to do each day, and so I resisted! My practice now consists of noticing; consciously stopping the busyness of life and breathing deep, which helps me see and appreciate what’s right there in front of me. I keep the practice alive by reinforcing it with technology; I’ve set up my iPhone to remind me to slow down and breathe, and I use a couple of apps to check in – what can I appreciate about this moment, this day? Developing this consistent practice took time, but it has made a difference to all areas of my life. My days are calmer, I’m more present, and I often have the experience of savouring a fine wine or a gourmet meal – except I’m savouring my life in all its flavours. Betsy Henry @ Zen Mama said : I feel that gratitude is thankfulness taken to the next level. It is a heart-felt and intellectual acknowledgement of all that is good in your life. It’s embracing uncertainty and feeling gratitude towards the bad things that have happened to us knowing that will lead you a new opportunity. I try to practice gratitude daily. ~First, I start off by being grateful for family and friends. ~Next, I’m grateful for the little things. ~Now the most difficult part, I have gratitude for the difficulties in life, too. My life changed when I began to have gratitude for whatever direction my kids were taking in life rather than control and trying to “help” them. Since I changed my reaction, our relationship has gone to the next level of mutual respect and love. Vishnu @ Vishnu’s Virtues said : To express my thanks in life, I recount all the blessings I currently have in my life. I usually pick a number from 10-25 items and write them down a list of all the things I’m thankful for. The second gratefulness practice is a dream-making practice where I follow Rhonda Byrne’s advice, from her book, The Magic, and write down what I’m thankful for even before the dream materializes. I write a list thanking the universe for what I want in life, like it’s already here. By practicing these two practices, I can give thanks to what I have and be thankful for what I’m certain is coming into my life. I’m thankful your inspiration and writings, Zeenat! Have a wonderful birthday. Tess Marshall @ The Bold Life said : I think gratitude is a way of life and I write out daily why I’m grateful and family friends and health are always at the top of my list. If I find my mood or energy slipping throughout the day, I remind myself of my blessings. I look around my home or surroundings and whisper words of thanks to the universe for all the love that surrounds me. My life is rich and my blessings multiply because I’m aware because of my focus and energy of constant appreciation. Cathy Taughinbaugh @ Treatment Talk said : Daily acknowledgement of what I already have in my life that is good helps me feel grateful. I remind myself by writing a line or two of gratitude at the end of my journal entry each day. A line of thanks for the health and well being of my children, for family and for the people who have made a difference in my life. I appreciate my good health, my work, and any recent positive experiences as simple as a beautiful day. Practicing gratitude keeps me humble, keeps me calm, helps me access inner peace and brings me happiness. When I appreciate the smallest things in my life, I find the inner joy that brings meaning, purpose and always love. Jenny Mannion @ JennyMannion.com said : Gratitude was one of the most important tools I utilized to heal from several chronic illnesses and disease. Since, it has been incorporated as an important part of my daily routine. In the morning before my feet hit the floor and in the evening before I shut my eyes I take some time to reflect on something, someone or several things I am grateful for. I don’t make it the same each time, instead taking those few seconds or minutes to bask in the beauty and blessedness of what I am paying gratitude for IN THAT MOMENT. I give it my full attention and feel it deeply with my heart. Often we get so caught up in what ISN’T right and worry about the past or the future. In paying gratitude you not only bring yourself fully into the present moment but by paying attention and by giving that praise of what IS GOOD – you are inviting the Universe to bring more of it into your life. Start paying gratitude every day and you can truly watch your life transform in ways you could not have imagined. Editors note: Jenny is offering her Ebook ‘Chakra’ & a half hour consulting session free to the readers of Positive Provocations especially for my B’day! Enjoy! CLICK HERE for your gift. Elle Sommer @ Reflecting A Life said : Gratitude is one of the highest vibrations in the Universe and I wish for everyone the gift of giving thanks each and every day, because it holds riches beyond our wildest dreams. Whatever we’re grateful for increases. And yes, it’s that simple. A smart choice for us all, is to make a decision to notice the many beautiful moments that appear in our day and give thanks for them. Whatever else is happening in our life, by our daily thanksgiving practice we invoke a nourishing, refreshing power that has the ability to transform us and our world. Just being grateful for the awareness that you can experience better health, or greater love, or a more abundant life can be enough to make all the difference. And I’m speaking from experience. I used to suffer from what’s been called the most painful condition known to man on and off for years. Once I began to express gratitude for the greater health I knew I could experience…the means appeared to support that belief and today I’m pain free. And that’s no small blessing. Vidya Sury @ Going A-musing said : I grew up learning that the more grateful we are, the more we receive. It is true. As a little girl, I used to thank God for giving me a wonderful family, food every day, books to read, the radio, footwear, clothes…just about everything I had in my young life. Today, that prayer still holds good except that the way I say it sounds different and includes more things. I wake up, light the lamp and pray, beginning the day with thanks for all that I have, and gratitude for all that I might receive that day. I also write a gratitude journal, noting every little thing. This lifts my spirits during the rare times I feel low, because there’s so much to feel thankful for. My son practices this, too. Appreciation equals happiness. Happiness equals a wonderful life. I have a wonderful life. Any sadness I might feel from the past, hurtful experiences or memories – all fade when I think of what I have this specific moment and feel grateful. The sun always shines in my mind filling me with positivity. Fran Sorin @ FranSorin.com said : On a daily basis, I have specific rituals for practicing gratitude as well as spontaneous moments of experiencing it. Here are some examples – When I get up in the morning, my inner voice says ‘ Thank you God for another day on this earth.’ When I do my morning practice of spiritual reading, meditation, going in the garden, and feeding my dogs breakfast, without forcing it, I experience gratitude. I set my intention when I go rowing and take the dogs for a walk in the morning to smile and send love to individuals that I see. Throughout the day, again without thinking about it, when I feel moved by anything – it can be music, an interaction, nature- I feel gratitude – and make note of it. Practicing gratitude has had a significant impact on my life. Prior to understanding what it meant, I was untethered and let my moods control me. Today, it is the practice and acknowledgement of the importance of it in my life that grounds me, helps to simplify my life, and guides me in experiencing the joy of living. Editors note : Check out Fran’s Amazing book ‘Digging Deep: Unearthing Your Creative Roots Through Gardening’. David Stevens @ David Stevens Life Coach said : I try to look at all things in a simple straightforward manner. And Gratitude is no different. Sure there is so much to be grateful for especially when I really think about it …. and I have. Drilling down or peeling back the layers of my life reveals, to me, the vastness of my gratitude. I accept that all that has come before me, all that is happening now, all that will come to me in the future is worth being grateful for. Amen. Knowing that gratitude is an automatic self expression of mine brightens an already bright day and lightens my day when some dark times descend. Amen again. Victor Schuller @ VictorSchuller.com said : The way I practice gratitude on a daily basis is that I take time to look at my family and simply appreciate them. I look at my daughters and tell myself how fortunate and lucky I am to have them. I tell myself how thankful I am to have my wife in my life, and I am now a poet and I didn’t even know it. 🙂 I look around at the abundance in my life, and offer up thanks to God for everything I have come to enjoy in life. Finally, I take time to think about the things that I take for granted, like waking up in the morning, being healthy, having a healthy family, and so on. I have noticed that since I have adopted a more conscious practice of expressing gratitude, I have a more positive disposition, and things don’t “bother” me as much as they used to. In general, I have become more present and aware, stopping to consciously soak in the joy of life and all the goodness and abundance the universe has to offer. Suzie Cheel @ Love you, love your life said : Gratitude is central to my healing journey and my life. I give thanks when i wake in the morning before I get out of bed and I give thanks in my blessing/ gratitude journal before I sleep. I write 3 things I am grateful for: eg Today I am thankful for the children I saw playing when i was walking on the beach because they remind me the joy that comes from being in the now. I make this book special by giving it a special cover. I give thanks during the day for the food I eat and how it nourishes my body and makes me feel abundant. “Abundance flows from the wings of gratitude” When I give thanks I know i open the doorway to love, to health, to joy and so much more. Gratitude has has such a positive impact on my healing process, my mind and continues daily to show me the love and abundance that blesses my life daily. Being grateful​ ​uplifts me even on those down days. Angela Artemis @ Powered By Intuition said : To live with gratitude is to live in a perpetual state of grace. Gratitude for everything – even things you might not welcome – opens your heart and lifts your soul above the mundane level to a plane where nothing but pure goodness resides. I use a mantra throughout the day to stay focused on gratitude. My favorite comes from Hawaiian shamanism, “I’m sorry, forgive me, thank you, I love you.” When I start complaining I remind myself to be grateful for everything and repeat my mantra. Within a short period of time I notice I’m quite content and have forgotten all about whatever had been bothering me. Life is so much better when we focus on all the good that truly surrounds us. I try to do this each day, sometimes miss, but I notice the impact when I miss too many days. I have a file on my computer. Not a gloriously decorated book, nor a special pen. I cannot believe how this simple practice affects my demeanour and general sense of happiness. It programs my ‘radar’ to look for things to be grateful about in each day. Wonderful. Let me end this Gratitude post by conveying my immense gratitude to YOU the reader for being here and lighting up my life with your presence. I remain in gratitude to you always. And now its your turn What are you grateful for today? How do you induce gratitude and simplicity in your life? Please share your amazing thoughts and wisdom in the comments below. Let celebrate and be grateful together. GET YOUR ‘POSITIVE HAPPINESS GOODIES’!!! 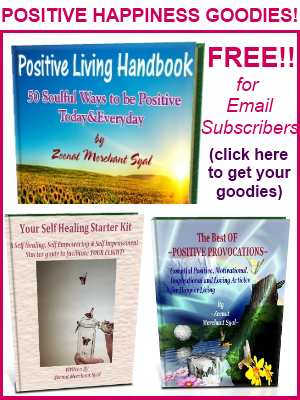 Get the latest articles(FREE) as soon as they are published, by Email OR RSS.PLUS if you are an Email Subscriber, You get the Positive Living Handbook+My Ebook “The Best of Positive Provocations”+ “Your Self Healing Starter Kit”. Come Join the facebook community & follow me on Twitter and Google+ for Positive Provocations Everyday! A gratitude attitude does indeed make for joyful living! Hope you have a happy and blessed birthday, Zeenat! Celebrate! I got a good reminder from Galen to say thank you to more people in our lives more often. And Fran’s simple but powerful morning prayer of being thankful for simply another day on earth. Finally, this line of gratitude by Evita really resonates: It has empowered me to be accountable for being the source of my own happiness, and the creator of my life experiences. I can really resonate with what you wrote about consciously choosing the simpler things in life. I too have seen some major change in recent years where I’ve gone from someone who always wanted to more, to someone who is now far happier with having less. Because in a strange way, less is more. Thank you very much for inviting me to share your special day with you! 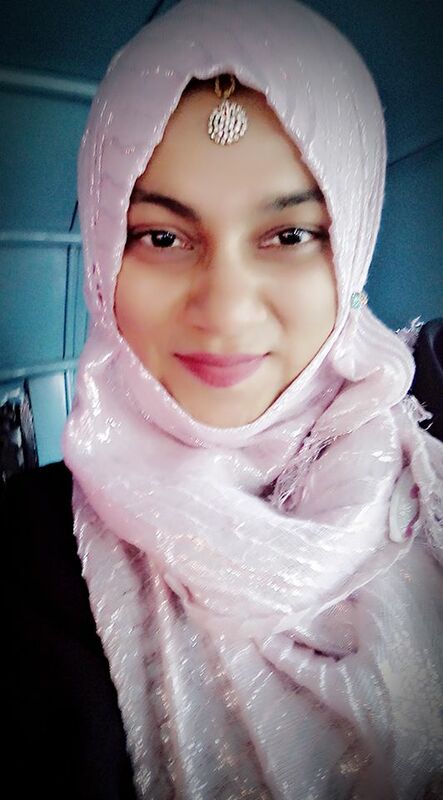 Thanks for devoting your birthday post to the wonderful topic of gratitude… that shows what a generous spirit you are, Zeenat! Have a fantastic birthday! What a totally delightful post, Zeenat! Happy birthday to you – I especially prayed for you this morning. Gratitude paves the way for a happy life. And you, my dear, spread sweetness and light like none other. Love you. Hugs! I am honored to be included in this special post! What a lovely post, Zeenat! Thank you for including me in your birthday post. I loved reading the various entries and it is always nice to be introduced to new bloggers. I’m so grateful that I have connected with you. You are a joy and spread so much happiness to others. Thanks for this post and have a wonderful birthday!! What a wonderfully happy birthday post Zeenat. I’m honoured to be included in your gratitude circle and what a blessing it was to read everyone’s gratitude habits. I was grinning from ear to ear…what a huge vibrational boost. Thank you dearest One. Practicing daily gratitude has changed my attitude towards life in so many ways over the last few years. For me its acknowledging every small blessings and being thankful to the Allmighty as well as trying to pay it forward. Thanks Zeenat for writing up about this wonderful topic. Zeenat, what a beautiful post! Thanks for including my little contribution. A truly beautiful round-up from a truly beautiful soul. Thank you for including me, and a very happy birthday dear Zeenat! Thank you everyone for making my birthday sooooooo full of happiness and joy! All of you are marvelous beyond compare and I love you’ll. My Birthday was full of a lot of LOVE, just the way I like it. Your lovely wishes and words are right here warming my heart. Thank you, thank you, thank you….You make my world brighter. I wish you the happiest of birthdays! I love the idea of honoring gratitude. Thank you so much for including me among so many wonderful writers. Hey Zee, thank you so much for this amazing collection and for inclulding my thoughts on gratitude too! I’m sorry I’m a little late but I just wanted to wish you an incredible belated birthday! Keep shining as the bright star that you always are! As usual I’m late to the party and I don’t have the time in inclination to read that whack of gratitude quotes up there that constitute a mini-ebook. lol 😀 I’ll return to read them at another time. Right now my heart is full of gratitude for what you share in this blog all year round. Reading your posts keeps me on the positive track and encourage me to keep up my long standing gratitude practice. I trust your birthday was full of love and laughter that will overflow creating a stellar year for you. Wow, I am saturated and steeped in gratitude! What an absolutely magnificent way to celebrate your birthday. Thank you! I loved reading what everyone had to say!! So grateful to be part of this incredible group. Happy Birthday dear Zeenat! !